My interest in genealogy was sparked by a request from my father: he wanted my help in finding information on his paternal grandparents. My father did not know their names, but he had heard that they were from Ireland. My grandfather died when I was young, and his only living sibling didn’t want to talk to us about her parents because it was “all in the past,” so I began my search by obtaining a copy of my grandfather’s birth record. I couldn’t wait to tell my dad the names of his father’s parents, which were listed on that birth record: Thomas Curley and Margaret Glennon. From there I began to gather information on this family, searching census records, city directories, and vital records to find out what became of my father’s grandparents. I learned that my grandfather was the youngest of ten children. His mother Margaret (Glennon) Curley died of typhoid fever when he was two years old, and his father died of pneumonia ten years later. After Margaret died, the children were sent to live with various family members. I now had a clearer idea as to why my great-aunt did not want to talk to us about her parents. She was only eight years old at the time of her mother’s death. I can only imagine the loss she felt by losing her mother and being split up from the rest of her family. He informed me that he was the great-grandson of one of Margaret (Glennon) Curley’s siblings who had remained in Ireland. Luckily, I was about to go on a trip to Ireland with a friend, so we made plans to meet during my vacation. During my trip I spent a day in Taughmaconnell Parish with my newfound Glennon cousins. They showed me the property where Margaret (Glennon) Curley and her siblings grew up, as well as the childhood home of her mother, Anne (Galvin) Glennon. They brought me to the old parish cemetery, showing me the headstones of various Glennon ancestors, and we spent a few hours sharing family stories. Motivated by my visit with the Glennon family, I returned home and continued to search for the birthplace of Thomas Curley. I later discovered that he was also born in Taughmaconnell Parish. Again I had the good fortune of being contacted by a distant Curley cousin from Ireland who was also researching this family, and was able to learn more about my great-grandfather’s family. I have enjoyed researching various lines of my family over the years, but my research on the Glennon and Curley families has been the most meaningful to me. 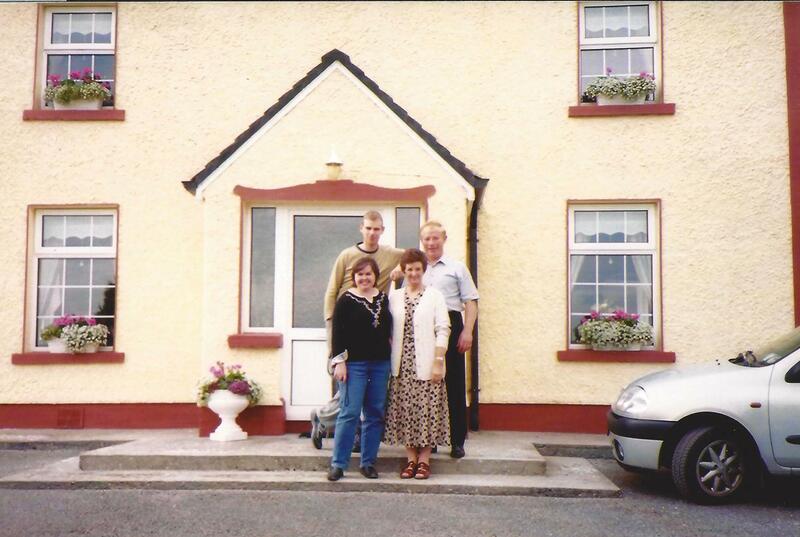 It was an amazing experience to stand on the same land in Ireland where my great-grandmother Margaret (Glennon) Curley and her family once lived. More importantly, my father went from not knowing the names of his paternal grandparents to connecting with members of the Curley and Glennon families who were once unknown to us. My father and I have talked about taking a trip together to visit these family members in Ireland, since he has not been to Ireland since I started my research. I look forward to sharing that experience with my dad. 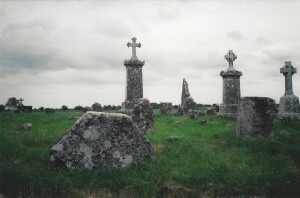 I have had great luck with my Irish side by connecting to Ireland Reaching Out — also known as the national reverse genealogy project. We have gotten back as far as our 3x great grandparents in the early 1800s. With the help of local people, we had maps of where the families’ houses stood (one still standing) and were welcomed at the family church in Fauleens, Carracastle Ballaghaderreen, County Mayo where the priest delivered copies of baptismal records for one of our great grandparents and siblings. Ireland is doing a great job helping those who left to reconnect and learn about their families. I connected with several cousins in the States that shared my Irish ancestry. We had all heard vague mutterings of a feud over property. My mother had visited the ancestral home in the late 1940s and commented that “it wasn’t worth the fuss,” but didn’t tell me any more. So 60 years later I figured out that my branch was the “bad guys,” at odds with the others. I’m thankful it’s all been laid to rest. I don’t have any Irish ancestry, that I know of yet, though I have some Scots-Irish. Learning, as you have, and as Carol did, that there are reasons, often sad, that older family members don’t want to dig into the past, can be painful. The search, though, can often help heal those old wounds, at least for the younger generations. I do hope you and your father can take that trip to Ireland together, and that you’ll share some of it with us. How can I find your article about Nobles County, MN as my husband had Irish roots from there? I too have a Glennon from Onagh but even though my maiden name is Curley the Glennon in my tree married my grandfather’s sister Bridget Norton. How wonderful to be able to visit and see where they all came from. Even though their memories of Ireland were painful they all were very close for several generations after coming to Massachusetts. I am a Norton from Churchpark, Taughmaconnell – I have Spellman’s, Glennon’s, and Norton’s in my tree. I live in Framingham now but my family lived in JP from the 1880’s onward. Great post! Question, do you happen to know if your grandfather had a sister named Annie Curley? I am at a stop with my search. Annie’s birthparents are Thomas and Margaret Curley but I am not sure of Margaret’s maiden name. Thanks in advance!